Kleenex® Wet Wipes* Gentle Clean for Hands and Face is rated 4.6 out of 5 by 504. Rated 5 out of 5 by Flipnsar4 from Great wipes The wipes are very good for all situations needed for everyday uses. Very pleased with wipes and results. Rated 5 out of 5 by annieday99097 from Gentle cleaning power anytime. Overall i feel like this is the perfect solution to any need to cleanse, clean or freshen up. The convenience makes this experience even better. 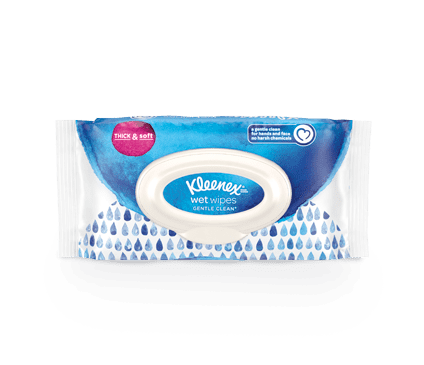 I feel like i want to have a pack of these Kleenex wet wipes gentle clean in many of my normal spaces like my purse and car, as well i am keeping these in my bathroom for an easy and refreshing nightly facial cleanse. Rated 4 out of 5 by thesc00p1 from Powerfully convenient cleaning power I found these Kleenex Wet Wipes to be tough and soft, with great cleaning power. The compact package was easy to store or carry on-the-go. Rated 5 out of 5 by DadsDuty5 from Gentle Clean is a Gentle Winner I feel that the wipes were moist enough, (not too dry, not too wet). They were also super soft as well as very durable. They also have a very light pleasing scent. Rated 5 out of 5 by Shann5 from Awesome wet wipes These wipes are soft but durable. They are well saturated and just the right size. They really do provide a thorough cleaning for hands. I have not used them on my face but I can see them being gentle enough for the face. They have a pleasant clean scent that is not bothersome. They also do not dry out my skin which I absolutely love! Rated 5 out of 5 by caresflorida1 from Left no taste on my face! The smell was great, not too strong and refreshing. The material flexed one way and didn't the other making it quite strong. It was able to exfoliate my skin without really noticing (no scratchy fabric). It was very soft and comfy as well as cooling when trying it on other areas. Rated 4 out of 5 by Willster4596 from A great clean! These Kleenex Wet Wipes Gentle Clean were great at making sure my hands and face were nice and clean without the dry skin that washing with soap normally causes. The wipes lasted much longer than I thought they would and one wipe was enough for my hands and face no matter if it was just a regular clean or after eating BBQ wings. One wipe does it all and is gentle on your skin, what more can you ask for, these wipes are great! Rated 4 out of 5 by dreamy11926 from Refreshing I use the Kleenex Wet Wipes Gentle Clean to clean my face and also to clean my dogs face and body. I like that it is gentle enough to use on myself and them, it refreshes there coat. Will definitely keep buying this product. Rated 5 out of 5 by shwkay4 from Excellent These wipes are great. I usually have problems with skin irritations but I didn't. They're also strong and didn't rip apart like others I've tried. They're very soft and leave skin feeling clean. I definitely recommend these. Rated 4 out of 5 by JChan7136 from A nice Thick wipe It's a wipe. It is thicker than other brands that I've used but I didn't notice a huge difference in effectiveness. Rated 4 out of 5 by agreeen10 from Perfect for Quick cleanup! great product to clean yourself "on the go", perfect for car or office desk..much quicker and easier than running to bathroom for soap and water! Rated 5 out of 5 by marinka2556 from great to replace make up remover I was honestly impressed with how soft and gentle these were on my skin when removing make up or after a good run outside. Rated 4 out of 5 by Chris247 from Cleans good. Overall the wipes were good. The only thing that makes me not rate it 5 stars is it did leave my hand a little sticky after using it. Rated 3 out of 5 by bonbon2 from Nice and thick! I was given these to try and I kept them with me in my purse. I loved how thick and resilient they are, it makes them great for cleaning messes and hands from anything extremely dirty and they do not dry out your hands. Rated 3 out of 5 by shortlightugly4 from Wipes review You're into this product or you're not. Effective tool for cleaning. Rated 5 out of 5 by Chris338 from Staying clean on the go Really nice to have on the go. I keep some in my desk at work and also in my car. Rated 5 out of 5 by Ennist8753 from Gentle Giant! I give Kleenex Wet Wipes Gentle Clean two very clean thumbs up. They are perfect to take with you anywhere you go. How many time have you been somewhere and needed a wet towel to clean something off you or a child? Wether the child was an infant or an adult, these are gentle and effective for both. Rated 5 out of 5 by Jackie282 from My title They were awesome, cleaned well, and didn’t tear what more could u want. Rated 5 out of 5 by Danotis954 from Great new wet wipe We were very happy with the Kleenex wet wipes. They were soft yet firm and didn’t break apart like the other brands. They were also great to use on her two-year-old son. Rated 5 out of 5 by Mh2114 from Excellent. Kleenex=perfect Very good product. Very easy to carry and store. Does a really good job cleaning making me feel clean and ready for the day. Rated 5 out of 5 by STEELMAN13 from Loving Kleenex It cleans everything that I to clean. It really does the job. It really helps to keep down the germs, from the flu, and other sickness. I just love it .